Accompanying the rapid developing of world economy, national strength growing and people’s living standard improvement, the building industry is developing fast and prosperously. However, a big pollution to the environment also appears here and there, a large amount of waste construction materials and waste water left at the construction site has become not only a waste of resource, but also an environmental pollution to the cities. The whole concrete recycling production is consisted of separation system, water supply system and electric control system. The separation system has two parts : Stones separation and Sand separation. 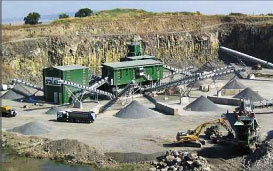 We provide jaw crusher, vibrating screen,and mobile crusher,ect. Separation system: It is the main part of the machine, it mainly consists of the feeding flume(accessory) stone separator, sand separator, frame and screen off-stone system. Water supply system: it mainly includes of submerged pump, sewage pump and spraying pipe. Electric control system: It includes of electric control box(manual, automatic) and cable. It controls on and off action of motor and valve under the operation procedure.